The Los Angeles Fire Department, recently challenged by yet another series of late summer wildfires, has successfully tested a new web-based tool developed by University of California San Diego researchers to perform data-driven predictive modeling and analysis of fires that have a high potential for rapid spread. 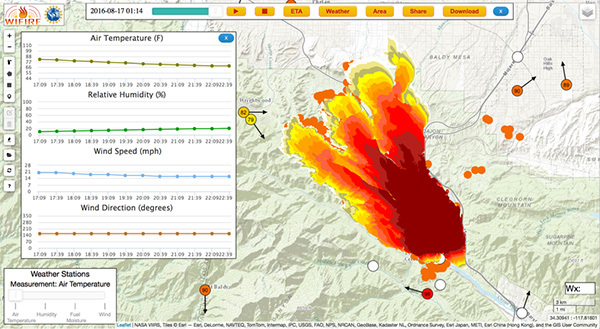 Called Firemap, and developed by the University’s ‘WIFIRE’ collaboration, the new tool enables a ‘what-if’ analysis of fire scenarios ahead of the time as well as real-time fire forecasting. The overall goal of WIFIRE, the result of a multi-year National Science Foundation (NSF) grant, is to make data and predictive models readily available so that the direction and rate of fire spread can be known as early as possible to assist in rescue and containment efforts. WIFIRE’s Firemap data resource also provides easy access to information on past fires, past and current weather conditions as well as weather forecasts, satellite detections as fast as they are received, HPWREN camera images, and information on vegetation and landscapes from a variety of sources. These are all datasets available on different websites that viewers can now see in one place, achieve programmatic access via web services, and be used for planning fire response and management of natural resources well ahead of time. Researchers at the University of California San Diego’s Qualcomm Institute (QI) have completed work on a new data exchange server that will provide the most recent weather data to anyone, including fire crews, to enable more accurate simulations and potentially save property and lives. The Environmental Data Exchange (EDEX) server was created by QI Senior Development Engineer John Graham and QI Director of Visualization Tom DeFanti with a $20,000 grant from the National Science Foundation’s Unidata Equipment Award Program. The server makes the data available on the 40 Gb/s ‘Prism’ network based at UC San Diego. It makes high-resolution weather data available to researchers worldwide and enables visualization of weather systems and events lasting months or even years. Predictive fire models and the fire response community will be making use of the EDEX via the WIFIRE Firemap tool. Firemap has already attracted some interest of a number of fire departments and was recently presented at the 20th Anniversary of the Annual Lake Tahoe Summit, where President Obama gave a keynote address on the importance of partnerships and innovation in tackling our shared climate and conservation challenges. Since the fall of 2015, the WIFIRE team has had a partnership with the Los Angeles Fire Department (LAFD) focused on a pilot study to use WIFIRE’s new Firemap tool in real-time fire situations. The WIFIRE team and LAFD tested the operational aspects of the developed technology on a drill in July 2016. In addition, in the Sand, Blue Cut, and Soberanes fires, which burned more than 200,000 acres combined in California earlier this summer, the WIFIRE team shadowed the actual fire progression with Firemap. The comparison between the fires’ actual daily progression and WIFIRE’s real-time prediction model were extremely close. To be truly vetted and operationally functional, WIFIRE needed a fire department to partner with. 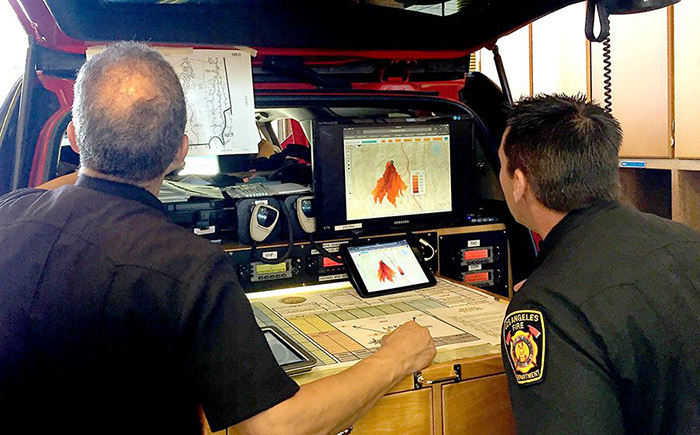 Recognizing the opportunity to leverage technology for his commanders making life and death decisions, LAFD Fire Chief Ralph Terrazas contacted Altintas to assist with the program development. UC San Diego was awarded the NSF grant in late 2013 to build an end-to-end cyberinfrastructure to monitor and manage real-time and data-driven simulation, prediction, and visualization of wildfire behavior. The WIFIRE project includes researchers from SDSC, as well as the university’s California Institute for Telecommunications and Information Technology’s (Calit2) Qualcomm Institute, and the Mechanical and Aerospace Engineering (MAE) department at the Jacobs School of Engineering. The University of Maryland’s Department of Fire Protection Engineering is also a project participant.